Have you notice in the quilt world that using fusible webbing has become more popular? I mean, you can see why. I mean why fuss with all those pins if fusible webbing products will just glue the fabric down? Well if you've been paying attention, you'll know that I'm not really big into fusing.. . . for lots of reasons. The biggest of which is that it tends to change the hand of the piece leaving you with this very stiff texture. There are no little "puckers" or "puffs" with your quilting. Its just flat. Very flat. Now that all said, fusing definitely has its place in my work. Sometimes its just easier to fuse!! Since, I have a few spots in my latest piece that needed fusing, I thought I would take another look at the new products out there. So I tested three "Light" fusible webbing products - Steam A Seam 2 Lite, Heat N Bond Featherweight, and MistyFuse. Now "Light" means that you they will hold your fabric down but you'll still need to sew them. All three claimed to leave the fabric with very little stiffness. (Don't confuse these products with their sisters - NO SEW - fusibles). So all I did was fuse down a little oval and sew along the edges with a zig-zag and sew my initial through it. All sewed down fine with Heat N Bond leaving a bit of glue residue on my needle. There didn't seem to be a difference on how the thread laid on the fabric. Steam-A-Seam 2 Lite - I used the new reformulated product and really like it better than the old one. I think this one was my favorite over all. I like how its repositionable, and it stuck well to the fabric. The directions were nice and clear. background fabric. The directions said to iron own for 5-6 seconds which I found weird. Also there was a distinct glue residue popping sound with the needle. 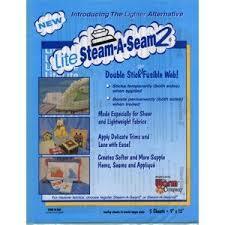 So at least now I know to keep a bit of Steam-A-Seam Lite on hand. Its harder to get now that its not being carried by Joann's fabric - but my Local Quilt Show does have a roll of it. I'm still wondering how well it ages since there has been a problem in the past - we'll see!! So what's your favorite fusible webbing and why? Please feel free to disagree with any part of this post!! I think it depends on what you do-I use Misty Fuse almost exclusively because the hand of the fabric is important to me. Great post and research! 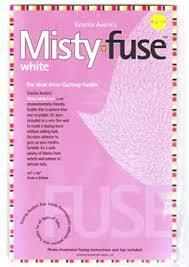 I agree with your thoughts on Misty Fuse and "mostly. With Steam a Seam. I don't know how well it ages either, but I found purchasing it on the roll (through the mail so it was technically a folded flat roll) was not as good as the sheets, at least in my one experience with the mail order. Some of the fusible stuck to the top where "Rolled" and made it unusable. I will, however, admit I should try it more than once from a different vendor to make a final determination. I agree with you that Misty Fuse is weird to work with. It sticks to itself and it would definitely be easier to use if it came on a paper sheet. But I do like its hand. Thank you for the comparative post on light fusibles, not just because of your results, but because it is a good reminder to not to become to complacent with a particular product and to my own comparisons. My current favorite fusible is french fuse. It isn't a substitute for light fusibles, but I bet you could collage/raw fuse on top of it quite nicely. I've found that there are fewer and fewer choices in some of the LQS places where I normally go. One annoyance is that some of the fusibles won't stay fused. I have to return to the ironing station in the middle of sewing or chance losing a piece. In those cases I fuse and pin, but then what's the point of fusing? I really appreciate your little test. I may conduct my own test based on yours to figure out which of the fusibles that are locally available is worth its cost. Great post. I don't use much but I am about to do some t-shirts for a school project. Great info. Thanks for the party. I linked today. I wanted to invite you to come over and link your party at my blog. I host The Fabulous Fall Party/Link The Linky. Any Fall Themed post may be linked(No Halloween please) and Linkys are most welcome. Just indicate it's a party in the link! I'm glad I found you. I'll be back. I prefer mistyfuse because of the lighter hand. I don't mind the "weirdness" and don't use the paper to draw anyway with the paper-backed kinds, so that isn't an issue for me! I just use parchment paper to work on, so I don't get fusible on my iron or ironing surface.